The Town and the Village of Geneseo have separately undertaken a series of programs to improve their clean energy policies. Each entity aims to use these initiatives to apply for grants from the New York State Energy Research and Development Authority. Both the Village and Town are part of the Clean Energy Communities Program sponsored by NYSERDA. Through the program, which any New York municipal community can apply to, governments are required to institute four out of 10 specific High Impact Action Items in order to qualify for grants, according to Geneseo Town Supervisor William Wadsworth. The first locality in each region defined by the program may qualify for as much as $100,000 to implement a clean energy initiative. The next eight communities can receive $50,000, according to Mayor of the Village of Geneseo Richard Hatheway. The Town’s completed initiatives include reporting buildings’ energy use, establishing a unified permit for community members to use when they want solar panels and training the town code officer to administer energy laws more effectively, according to Wadsworth. The last of the actions the Town plans to undertake is to institute an electric car-charging station, although the logistics have created some internal disagreements on the Town of Geneseo Board, according to Wadsworth. Hatheway explained that the Village has completed three of the four minimum actions required to qualify for any funding. Like the Town, the Village was able to begin measuring the energy output of government buildings and to streamline the applications community members fill out to acquire solar panels, according to Hatheway. 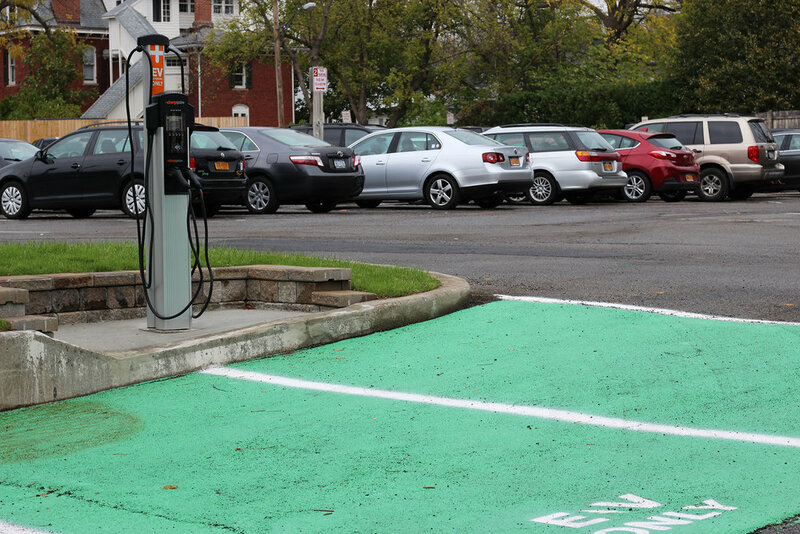 The Village also placed an electric car-charging station behind the Village government building, which was donated by the Genesee Region Clean Communities program. The last planned measure to qualify is to certify the Village code officer in energy code enforcement. Other High Impact Actions Items New York municipal communities can implement include achieving a 10 percent reduction in greenhouse gas emissions in buildings and campaigning to increase solar panel usage in the area. If the Village receives grant money from the state, it would buy and replace the approximately 400 street lamps that reside in the Village with more energy efficient and cost-effective LED lamps, according to Hatheway. Currently, Rochester Gas & Electric owns the street lamps and uses a more costly, high-pressured sodium bulb. Wadsworth believes that green energy efforts are especially important in the region in order to take care of the area’s natural resources.